Have you ever felt homesick? I wasn’t expecting to miss Mexican food like this, but now that I’m not the only Mexican food lover here I have the perfect excuse to go to the Latin Market and get 4 kilos of tortillas so we can skip all the steps and go straight to the “filling the tacos” part. I came across an interesting recipe the other day, while searching for something to cook with a packed soy mix, but I wasn’t sure about the procedure so I checked a few recipes and compare the ingredients this is also to adapt the limited amount of ingredients I have in my pantry. The first thing that shocked me was to find recipes with a fusion of tex-mex (a mix of texan and mexican food), I guess we all try to adapt to what’s there, so I won’t judge, but I will clear the air about hard shell tacos, and the only excuse I see for using them is that there’s nothing else and I mean NOTHING else to wrap your food, and still would prefer not to used them. Why? Because they crack in the first bite and then you have a complete mess instead of a taco, they are almost like chips, they don’t taste the same and just in case there’s still doubt we (mexicans) don’t used them, we like tacos with soft and warm tortillas, I should clear another point now that I’m talking about the “mexican ways” : we don’t eat enchiladas filled with cheddar cheese, we don’t put rice inside a taco, and finally if you are using a tortillas to wrap whatever is in your fridge that doesn’t mean you are eating Mexican food. 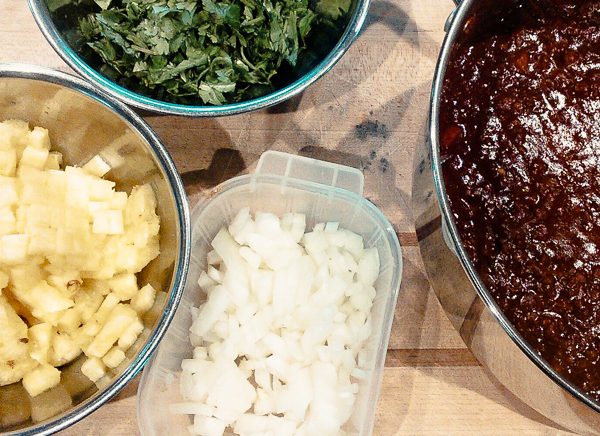 Unless you make a fusion that is going to become part of the traditional ways then it is, and I say it because tacos al pastor is an adapted recipe with roots in the Lebanese Cuisine back in the 1930s. Lebanese immigrants arrived in Mexico and left their print in the way this type of tacos are made, in Central and south Mexico are called tacos al Pastor, in the north we call them Tacos de Trompo (trompo= spin, because of the resemblance with this object) originale made with pork and marinated in a sauce called “adobo” made of dried chiles and served with pineapple, cilantro and onions, always accompanied with red or green salsa. …and here it is my adaptation of this delicious and meatless dish! 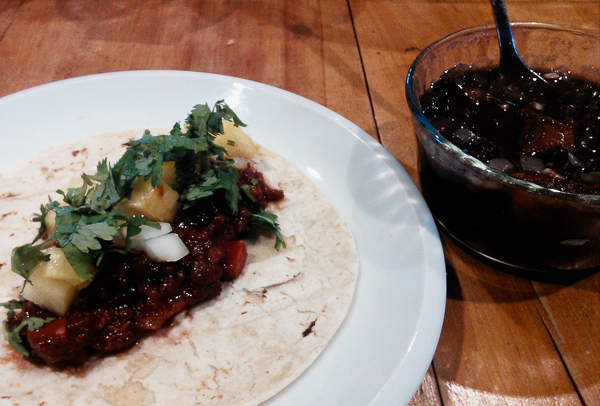 To prepare the marinade , let the chiles (pasilla and guajillo) and the tomatoes sit in boiling water for 5 minutes. Drain and grind in a blender along with the garlic clove . Fry sauce in a little olive oil. Set aside. Bring water to a boil , as it boils , turn off heat and add the soy . Soak for 1 minute. Drain in a colander. With great care not to burn , squeeze well to get all the water until it is as dry as possible . This can take the taste of soy and it is absorbent and acquire the taste that you want to give . I you have packed soy skip the previous step. Saute soy and squeezed slightly in a pan with olive oil. Add the soy sauce and lemon juice and mix well. Add the marinade and continue cooking a few minutes, stirring to integrate the flavors . Rectify seasoning and add salt if you need . Heat the tortillas , filled with marinated soy . Serve sprinkled with cilantro , onions and chopped pineapple .